Media Briefing: Premier Sylvia Lucas clad in red, flanked by MEC Martha Bartlett and HoD Tshepo Pharasi and some officials at Friday, 4 January briefing. 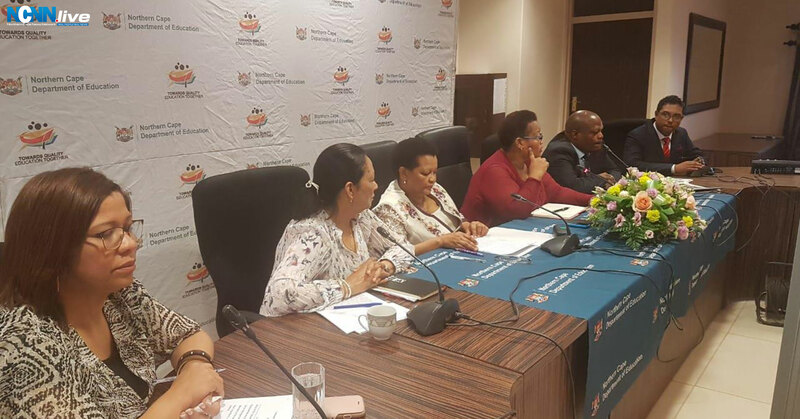 The Northern Cape’s 2018 matric pass rate of 73.3% sealed the province’s fate of having been unable to attain a percentage of above 80% over the last decade. 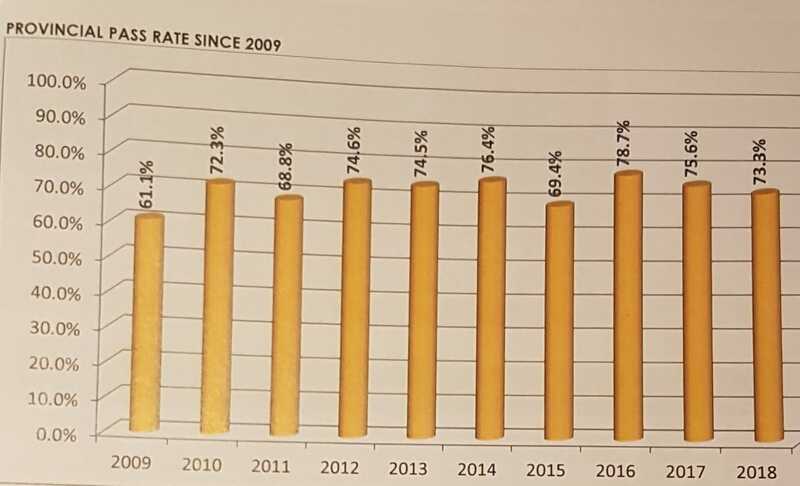 With the 2018 results drawing much criticism owing to having raised eyebrows with a two-year decline from 2016’s achievement of 78.7% to obtaining 75.6% in 2017, the province has since 2009 failed to break into the 80% bracket. This, in sharp contrast to having been atop the standings three years in a row between 1999 and 2004 and playing second fiddle to the Western Cape in some of the years. Six hours earlier to Saul’s past Friday afternoon posting, Premier Sylvia Lucas mildly called for a “proper analysis” of the results in determining the basis for the two-year decline and assuring the media briefing audience of the commitment of the MEC Martha Bartlett in stating “my friend was always away” which robbed her off sharing lighter moments with her, the chairperson’s rebuke took no prisoners. The provincial ANC’s official response was similar in tone: “It is particularly concerning for the ANC that there seems to be no improvement in matric results both qualitatively and quantitatively. The provincial officials of the ANC will soon meet with the leadership at the department in an effort to analyse the results and agree on a way forward,” said secretary Deshi Ngxanga in a media statement. The province’s official opposition Democratic Alliance complained about “learners who are failed” by the department in not being able to reach matric. Its leader Andrew Louw drew attention to the disparities in numbers between the 23 082 learners that had enrolled for their Grade 10 in 2016 and those that sat for their matric exams of 2018. “Only 9 909 wrote exams last year, which means that only 42.9% of the learners enrolled in Grade 10 actually went on to write their examinations. And of this small group only 31.5% passed. What this calculation shows us, is that only one in every three learners in Grade 10 in 2016 went on to pass their exams last year. The provincial chapter of the Young Communist League of South Africa (YCLSA), has not only decried the two year decrease in matric results but declared to assist and progressively so. “All YCLSA structures will lead the Progressive Youth Alliance in visiting and adopting schools (particularly poor performing schools) in their respective communities from Monday 7th January 2019, as part of our Joe Slovo Right To Learn Campaign. The campaign will focus on and assist our schools to prepare for the 2019 academic year,” said spokesperson Michia Moncho. The John Taolo Gaetsewe district with its 29 high schools and the source of what was once blamed for the Northern Cape’s brief decline amid the 2006 incorporation of its largely rural schools into the province, is now the pride and joy with a district based increase of 1.8% being the highest and catapulting itself to position two with a pass rate of 73.2% when compared with the four others and notably rising above its gangsterism and other ill-discipline challenges. The district with the largest percentage drop is Frances Baard at 4.1%. Despite the department’s head Tshepo Pharasi having been defensive in pointing out at the briefing that South Africa’s top three province’s Gauteng, Free State and Western Cape are engaged in a “high stakes” matric results battle by investing own revenue, the unbalanced equation is in bearing a budget of R6,4 billion and with R4,9 billion allocated towards employee compensation in the 2018/2019 financial year – hovering at 77% of the total budget. The department’s Achilles heel is in having drawn way too many teachers from the classroom and converting them into its administrators that had transitioned from the “classroom toil to the adored officialdom of better life earnings.” The loss of capacity in officials that were the “formidable force of the golden matric results years” also added insult to injury. In zooming into the classroom and with Premier Lucas asserting that “teachers need to teach,” the Northern Cape only had two high schools with matriculants who wrote their examinations in 2018 being above the figure of 200. From the province’s 139 high schools – a massive 103 of them had matriculants under 100 who sat for the final year paper whilst the remaining 36 made up for numbers above 100 but under 200. According to the department, Warrenton’s Warrenvale Hoërskool with its 22 matriculants gained a pass rate of 95% will all 22 learners passing, whilst Vaalharts Gekombineerde Skool had 7 passing from 13 thus gaining a mere 53%. The fact that no district scored a pass rate below 70% is the province’s ray of hope in seeking a return to the “golden years” of above 80% matric pass rate and with a blessing of it being qualitative with a promise of a productive future for those exiting the schooling years.